Ford Motor Company bested its previous full-year hybrid sales record in just the first five months of 2013, driven by the product strength of its new electrified vehicle lineup including Ford C-MAX Hybrid, Ford C-MAX Energi, Ford Fusion Hybrid and Ford Fusion Energi, as well as Lincoln MKZ Hybrid. Ford beat its previous full-year hybrid sales record of 35,496 vehicles in 2010 with projected sales of 37,000 through May, an increase of more than 375 percent over the same period last year. Ford is now second only to Toyota in the number of hybrid vehicles it sells in the United States with its market share continuing to grow, up from 3 percent last year to an all-time-high 15.5 percent through April 2013. Ford C-MAX Hybrid and Ford Fusion Hybrid continue to draw new customers to the Ford brand, with conquest rates remaining highest in the Ford showroom since the launch of both vehicle lines. Fusion Hybrid conquest sales are holding steady at 67 percent, with C-MAX Hybrid at 63 percent. The new lineup continues to draw new customers from Toyota and Honda, with most conquest sales coming from Toyota. Ford Fusion Hybrid continues to fly off dealer lots, attaining some of the highest turn rates in the Ford showroom. Fusion Hybrid is turning in just 14 days on average as customers are drawn to the all-new car’s fuel economy, styling and design. This turn rate is even higher in key markets like Los Angeles, at just 10 days. 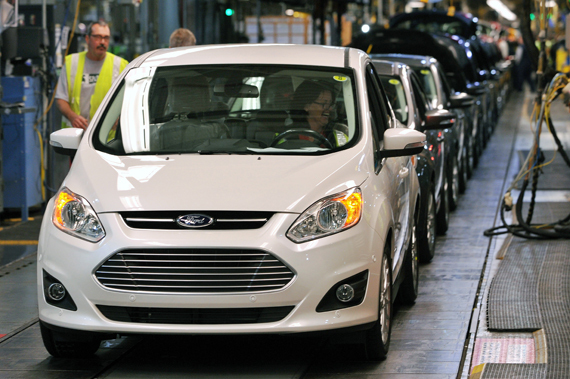 Fusion Hybrid represents an all-time-high percentage of overall Fusion sales, at 15 percent. Ford Fusion Energi plug-in hybrid – the newest addition to Ford’s electrified vehicle lineup – is also expected to achieve its best sales month ever since its launch in February. “Our all-new electrified vehicle lineup is drawing new customers to the Ford brand,” said C.J. O’Donnell, Ford electrification group marketing manager. “We are growing our business by providing fuel-efficient products that don’t force customers to compromise the design, technology and comfort that are available across the Ford lineup.